Power Over Ethernet in a 5 1/4 inch bay. Firstly the standard set of disclaimers... "don't do this at home", "use only under adult supervision", "if illegal to do so, do not modify any electrical device", "this WILL void your warrantee". 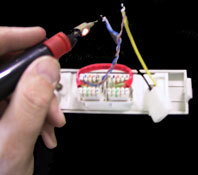 This page is to provoke an idea, not to teach you about network wiring or electrical procedures. If you don't know what you are doing, ask someone who does. Most of all, enjoy. I want to run an access point at the top of a 50 foot pole and don't really want to run a power lead up there too. I also don't want another bloody plug-pack transformer filling-up a power point in my office. 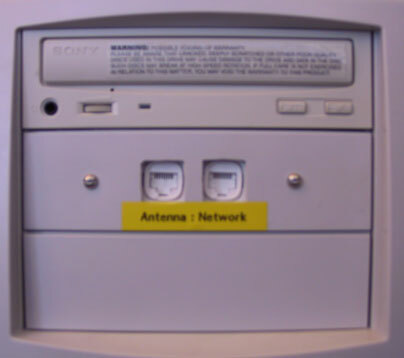 Power over Ethernet (PoE) and get the power from the PC that does the 802.11b wireless routing (this PC is always on when the wireless access point is in use anyway). 1. 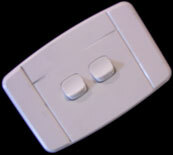 Start with a cheap, flat double light switch. This one cost about US$3.00. Remove the two switches, they should just clip-out leaving a mounting plate to suit the RJ45 sockets. 2. This is a 5 1/4 inch drive bay blank. Yours may differ in looks but the size will be the same. 3. 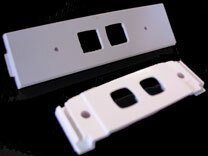 Using a hacksaw cut the switch plate into a strip that will fit inside the drive bay blank. You could use epoxy glue to mount the RJ45 "krone" sockets but in my experience it is messy stuff and I would rather have a screw than end-up with messy goo all over my hands. 4. So now you should have two parts that look like this. Next mark on the back of the drive blank where the 4 holes should go. 5. Using your square drill bit cut the two large holes in the face plate and using a standard round drill bit cut two small-round holes for the screw mounting. 6. Wire it up. The standard wiring for Cat5 is EIA-TIA 568a and only the Orange and Green pairs carry signal. The blue and brown pairs are free for us to run power over. If you dont have a "krone tool" dont worry, the back of "stanley blade" will work ok too for a "weekend hack" like us. For wiring details see the end of the page The POSITIVE (yellow) on power connector is soldiered to the brown pair, the NEGATIVE (black) is soldiered to the blue pair. Here you can see the two blocks "jumpered" together to pass the signal (only the Orange and Green pairs are used). The power connector has only the Brown and Blue pairs from the "Antenna" side of the circuit. 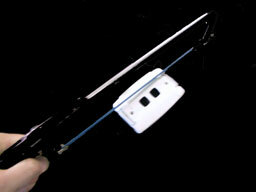 A cable-tie is used so that the wires are not pulled out from the socket easily. You should have something that looks like this now! The only things left to do are to label the face plate so you know which has the "injected power" and the most important part of the project... TEST IT BEFORE YOU PLUG IT IN. Use a multimeter or even a torch battery and light globe to test the pin-outs before plugging an expensive computer and access-point into this. The end result looks like this in my "wireless server". You can see from the above table that pins 4,5,7,8 are the ones that carry the 12V power. At the access point end you should be able to modify the RJ45 socket so that pins 4&5 run to negative and pins 7&8 run to positive on the access points power socket. I "modded" a Compaq WL400 access point by "patching" the underside of the RJ45 socket to the factory power socket. I was lucky that the WL400 is designed to run with a fairly broad power input, you would be wise to make sure that your access point can run with 12V or risk the chance of "blowing it to bits". The above PoE 5.25 inch hack worked well for me!